WASHINGTON, D.C. -- Although barely one in four Americans are satisfied with the way things are going in the U.S., majorities are satisfied with the overall quality of life in the U.S. (77%), the opportunity for a person to get ahead by working hard (65%) and the influence of organized religion (53%). 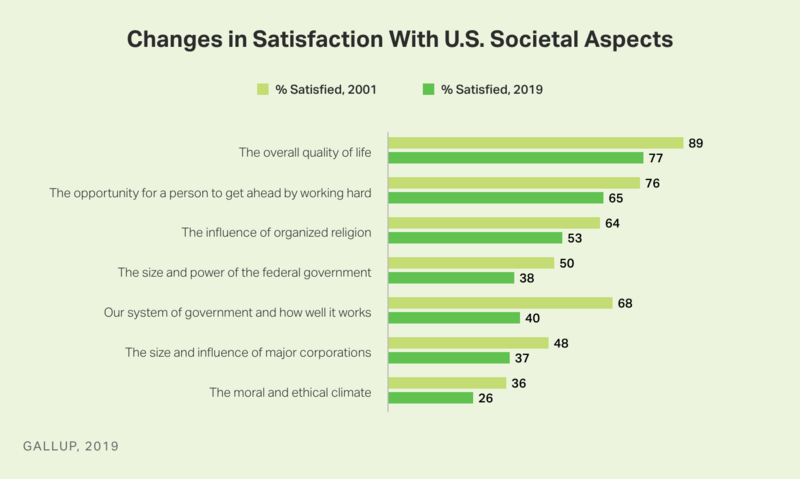 At the same time, Americans are largely dissatisfied with other aspects of U.S. society, especially the moral and ethical climate (26% are satisfied). The current results are based on a Jan. 2-10 Gallup poll. Gallup has asked Americans about these aspects of society each January since 2001, with the exceptions of 2009 and 2010. Quality of life has always gotten the highest satisfaction rating of these eight items, ranging from a low of 73% in 2013 to a high of 89% in 2001 and 2002. While more Americans overall are satisfied with the quality of life than the opportunity to get ahead, more say they are "very satisfied" with opportunity (35%) than with the quality of life (26%). Americans are most likely to be "very dissatisfied" with the moral and ethical climate and the way income and wealth are distributed, at 39%. The moral and ethical climate, the size and power of the federal government, the size and influence of major corporations, and the distribution of income and wealth have all ranked lowest on satisfaction in at least one year. More recently, Americans have been least satisfied with the moral and ethical climate, including a record low 26% this year. On an absolute basis, Americans are significantly less satisfied with each of these aspects of society than they were in the initial poll from 2001 (income and wealth distribution was not asked before 2014). The largest drop has occurred for satisfaction with the government system and how well it works, which is down 28 points since 2001. All the other items show declines of between 10 and 12 points. On most of these measures, the declines in satisfaction were apparent by 2011, and the satisfied percentages have fluctuated modestly since then. 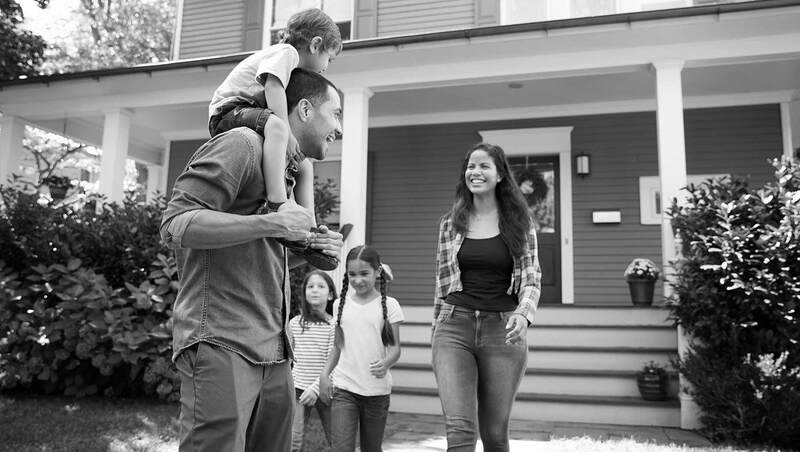 The most notable exception is on the opportunity to get ahead, which cratered to 53% after the Great Recession but has bounced back in recent years as the economy has improved. None of the eight items show meaningful change from the 2018 survey. As is typically the case, supporters of the president's party, currently Republicans, express greater satisfaction with almost every aspect of U.S. society than opponents of the president's party. Republicans and Republican-leaning independents diverge most from Democrats and Democratic leaners in their satisfaction with the way income and wealth are distributed, 65% to 19%. The two groups' satisfaction levels differ by 30 or more percentage points on the opportunity to get ahead and the size and influence of major corporations. Republican and Democratic satisfaction are similar, and low, in one area - the size and power of the federal government. 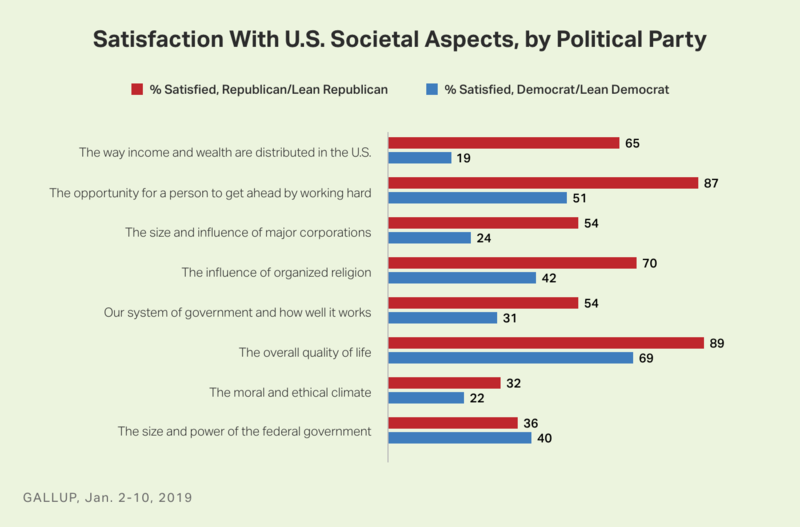 For both Republicans and Democrats, the top area of satisfaction is the quality of life in the U.S. -- 89% of Republicans and 69% of Democrats are satisfied. Nearly as many Republicans, 87%, are satisfied with the opportunity to get ahead. Republicans are least satisfied with the moral and ethical climate (32%), while Democrats are least satisfied with the distribution of income and wealth (19%). Democrats' satisfaction with the moral and ethical climate is also low at 22%. Sixty-five percent of Christians are satisfied with the influence of organized religion, compared with 31% of non-Christians (including those with no religious affiliation). Perhaps somewhat surprisingly, there are no meaningful differences by income in satisfaction with the opportunity to get ahead -- 64% of upper-income, 65% of middle-income and 64% of lower-income Americans are satisfied. A key factor in whether people are satisfied with economic opportunity is their assessment of their financial situation. Currently, 73% percent of those who say they are better off than a year ago are satisfied, compared with 51% who say they are worse off. 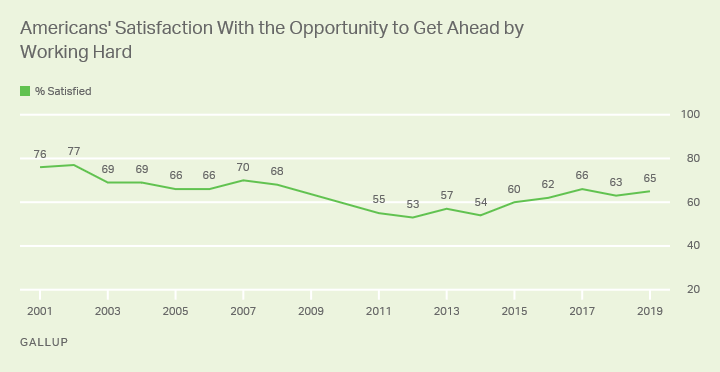 The difference in satisfaction with opportunity based on change in one's personal financial situation has been consistent over time and has been evident among supporters and opponents of the president's party alike, as well as among Americans at all income levels. Americans are less satisfied with key aspects of U.S. society than they were at the turn of the century. The diminished satisfaction likely reflects the long-term slump in satisfaction with the way things are going in the country more broadly, as well as declining confidence in U.S. institutions, and declining trust in government. Though Americans are less satisfied than they used to be, three-quarters remain pleased with the quality of life in the U.S. and two-thirds are positive about the opportunity to get ahead. Americans' biggest complaints are about the moral and ethical climate. Their satisfaction in this area is the lowest it has been, and also the lowest for any of the eight satisfaction items Gallup has measured since 2001. Satisfaction levels have not moved much since President Trump came into office. However, as is typical, beneath the surface there were expected shifts in the relative happiness of Democrats and Republicans after the transfer of power from a Democratic to a Republican president. If the economy stays about as healthy in 2019 as it was in 2018, Americans' satisfaction levels in these areas heading into the 2020 presidential election year will likely be similar to what they are now. The last time an incumbent president sought re-election, in 2012, most of these satisfaction ratings were similar to what they are now, with the exception that the ratings of opportunity were lower back then. It is unclear to what extent Americans' satisfaction with these specific areas influences voting and election outcomes. Most likely, their overall satisfaction with the way things are going in the country, and their approval rating of the incumbent president, carry a lot more weight.